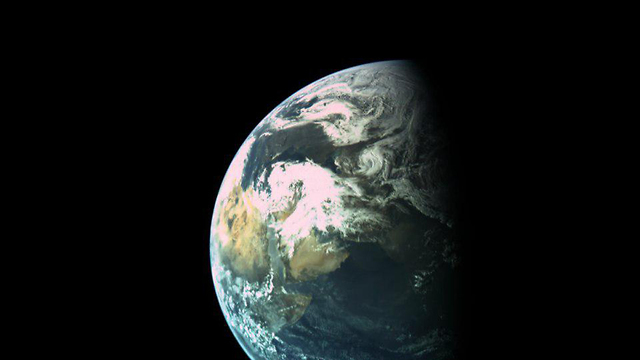 Earth as seen from Beresheet currently 10,000 miles away. The cyclone that is currently drenching Israel with much needed rain is clearly visible. Beresheet is swinging back towards Earth and today is successfully completed a 72 second burn of its rocket motors to transition to a moon intercept orbit. The maneuver was performed when the spacecraft was at a distance of 16 thousand kilometers (10,000 miles) from Earth and of course Beresheet’s cameras captured the encounter. The Middle East is clearly visible in the picture, with thick rain cloud cover over its home, Israel.